Blue Mail Media provides a wide range of marketing information essential for successful campaigns. Get our Colombia Email List, and you will know the result by yourself. Our list provides the highest level of accuracy as well as reliability in the market. You can search for a specific industry in that part of the world and interact with professionals with ease. We provide all the essential information required for your campaign execution. Take advantage of our convenient email list and build your customer base in Colombia with no much effort. The quality of the data we provide in our list is of high class. We have a team of data experts who keep updating the database for every 90 days to remove incorrect as well as add missing details. 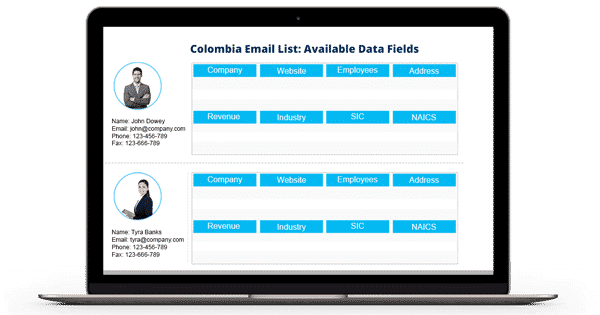 Give your product as well as company the attention it needs with the help of our Colombia Email Database. Blue Mail Media’s Colombia Business Mailing List is designed to comply with Anti-Spam law. The data you find on our list is from authentic as well as internationally trustworthy sources. It includes yellow pages, business directories, conferences, trade exhibitions, surveys, and more. And, these data undergo regular updates. Therefore, we can guarantee you more than 90% deliverability rate along with 100% authenticity. As mentioned above, we provide the list in a customized format to ease your marketing task. Hence you can filter and target the prospects based on your needs. It will not only help you in increasing the email campaign rates but also building a brand value across Colombia. We are happy to inform that our Colombia Mailing List assures low bounce rate and high open rate. Avail our Colombia Business Executives List and experience the power of our database by yourself. You can call 1-888-494-0588 or send an email to sales@bluemailmedia.com for any clarifications.